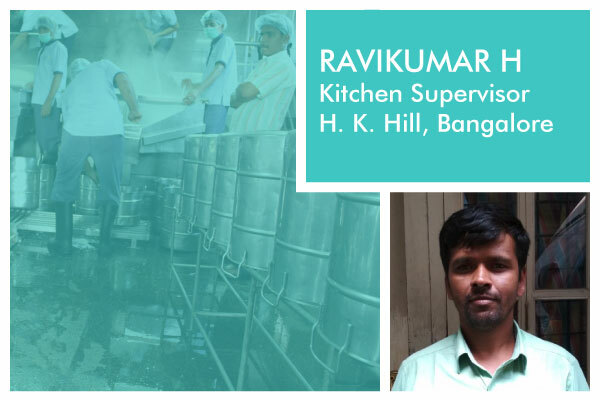 Meet some of our passionate members from Bengaluru kitchen for whom the only aim is ‘to benefit more and children with freshly cooked, nutritious, and hygienic meals on every school day’. I have been working here for the past 12 years. It all started when I saw a job advertisement in the newspaper. I thought of giving it a try and attended the interview. It was during the interview that I got to know the purpose of Akshaya Patra i.e. to serve food to children at government schools. This noble cause compelled me to join Akshaya Patra. And, I feel proud that I am in the service of children for more than a decade. I completed my PUC, but couldn’t continue with further studies due to unfavourable financial conditions. So, to support my family, I was on a lookout for a job. As a kitchen supervisor, what does your work encompass? As a kitchen supervisor, I am responsible to maintain records related to production processes. I ensure ISO standards are followed at all levels of production such as raw material cleaning and washing, vessel cleaning, plant hygiene, and keep a check on CCP & OPRP. Why is it important that kitchen processes are in order and meals are cooked in a hygienic way? Children are our future and it is very important to ensure that the food served to them is safe, hygienic and clean. Thus, we follow ISO standards of food safety in all our kitchens. How has your life changed after joining Akshaya Patra? My journey with Akshaya Patra began as a Helper in the food cooking and packing section. Then, I worked as a Route Boy and was responsible for on-time delivery of meals to schools. After completing three years with the organisation, I was promoted to my current position of a Kitchen Supervisor. I am very happy and proud to work here. My financial condition has improved, and I have resumed my education on a correspondence basis. Akshaya Patra is doing a noble work of providing food to children and by being a part of the organisation I am also able to contribute something to the lives of children. Additionally, Akshaya Patra conducts training sessions and employee engagement activities that improve our knowledge and skill, thereby helping us to perform better and keeping us motivated at all times. I have been working here for the past 5 years. I had an idea that Akshaya Patra is working for a social cause of providing food to children. This cause motivated me to join Akshaya Patra. Though I was employed, I faced troubles in providing for my family and supporting the education of my children. What does your job encompass? 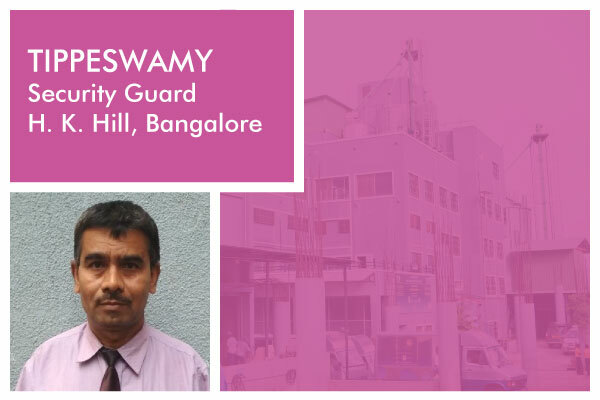 As a Security Guard of my kitchen, I am responsible for checking and maintaining records on raw material receipt, take employee attendance, check employees at the entry gate to ensure safety, take regular rounds of the kitchen, check and regularise temperature of cold storage, and communicate shift allotments to employees. I feel proud and happy to be associated with the Foundation. I am comfortable and look forward to continuing my service here. After joining Akshaya Patra, my financial condition has improved and I am able to take care of my family in a better way. Moreover, it gives me a sense of satisfaction because in some way I am helping thousands of children to receive nutritious meals every day. There is a lot of discipline and regularity in the processes and functioning of Akshaya Patra. This instils a sense of responsibility and punctuality among all staff members. My association with Akshaya Patra has provided me an opportunity to get involved in a noble service. In addition, Akshaya Patra conducts training sessions to enhance the skill set and knowledge of all staff members and also conducts employee engagement activities which keep us motivated all the time. Well, behind every great show, there are behind-the-scenes contributors. And, at Akshaya Patra, those contributors are our very own kitchen staff. Watch out this space to meet our passionate members from Assam! We would love to hear from you, so please use the below comment section to share your thoughts and feedbacks. Thank you Rajitha for your appreciation.